Seafood has always been a Scottish speciality. There’s a line of argument that all the good stuff passes under our noses on the way to Spain, but if you know where to look it’s here alright. If you want to eat local food, then heading to a good seafood restaurant is the best way to play the trump cards in your hand. Ondine has ambitions to be just this sort of landmark venue. Named after a mythological sea spirit, it’s the solo venture of Roy Brett, the Edinburgh-born chef who ran Rick Stein’s restaurants in Padstow from 2001 to 2005 and made dining destinations out of the sinister black Dakota hotels in South Queensferry and Eurocentral. Located one floor up from street level in the same new building as the Hotel Missoni on the Royal Mile, it has no ties to the hotel but shares its upmarket aura, with its dominant feature a large, curving crustacean bar that pushes all the tables towards two walls of window which peer out over busy George IV Bridge and Victoria Street. The nouveau, slightly swanky feel of the place with chunky black leather seats, branded blinds and waiters in what you might mistake for dentist’s outfits, doesn’t do full justice to the quality of food and cooking. 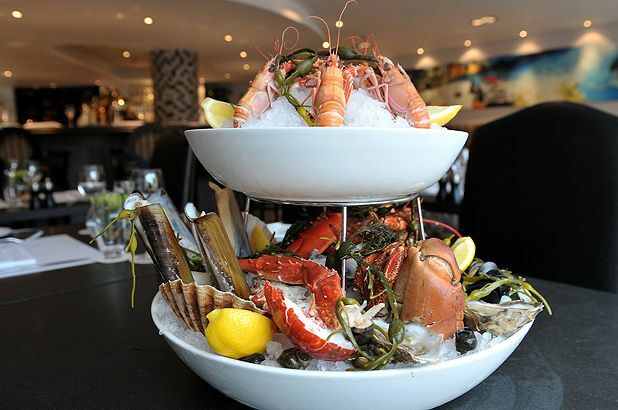 If you’re ever inclined to a blow-out on top-notch seafood this is where to do it, with four different varieties of oyster available, lobster thermidor, plates of razor clams and scallops or a platter of assorted hot shellfish expertly oven roasted to buttery succulence. That will cost you £28 (and still seem worth it), but despite appearances it’s not all high-end stuff with rich, French-style fish soup, a fennel-laced rabbit stew or tingling fish curry featuring a pearly slab of cod coming in at more familiar restaurant prices. Ondine isn’t yet stating the provenance of its fish, but it should. While much of the shellfish travels the relatively short distance from Eyemouth, Brett – a likeable and principled chef – clearly feels ready to lock horns with the ‘don’t ask, don’t tell’ policy that exists in many parts of the restaurant industry when it comes to fish. The cod used for the curry – as well as in ‘real’ fish fingers served on the lunch menu – comes not from the North Sea but from the Pacific, where the fishery is certified as sustainable by the Marine Stewardship Council. Ondine may well become something of a Scottish flagship for the MSC, which offers the most useful guidance for consumers in the complex world of fish sustainability. Sadly for not just Scotland but the world, certain fish stocks seem unlikely to survive our current fishing practices. Ondine’s promise is a chance to get messy with a bunch of sweet crustaceans, but in fuller knowledge and appreciation of their value.